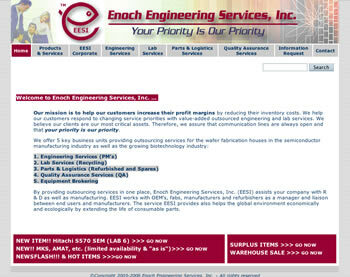 Enoch Engineering was a new company in 2002 and was looking to build the presence of an established company quickly. They did their part by attending trade shows and doing personal marketing. But they needed to direct potential customers to an internet address that could let the maximum number of people quickly find out what they were about. Happily, their website filled that role for them for many years. Recently they elected to make some changes and have a new website created elsewhere. We wish them all success in the future.